In Spring 2016, with graduation from the UCLA School of Theater, Film and Television (UCLA TFT) just a few months away, actor and writer Israel López Reyes, along with Roshni Shukla (M.F.A. '16), Darcie Crager (M.F.A. '16) and third-year graduate acting student Lea Madda, formed the theater-based "the southland company," using the knowledge they acquired during their master's program at UCLA TFT's Department of Theater, to create quality work that is interdisciplinary and reflects narratives that are commonly ignored in mainstream entertainment. "[There's] a lot of multiculturalism in our company, a lot of gender equality, a lot of very strong female voices," says Madda, who graduates in June 2017. "We want to reach into a world of stories that have been wanting to be told for a long time but haven't had the safe home to actually do that." Although southland is new, López Reyes, who was part of several other Los Angeles-based companies prior to beginning his graduate work, has been planning to start his own group for years — and attending UCLA TFT was part of that plan. "The reason I came to UCLA was because it has a strong acting program but also because it has a strong playwriting and directing program," the Los Angeles native says. "During my three years there, I purposely sat in on other [directing and producing] classes to build relationships with directors, playwrights and film people so that when I graduated I'd have a company." He first approached Sacramento native Shukla, who, it turns out, had a similar idea in mind. "I was thinking that it would be lovely to continue our physical training in Suzuki (a popular acting method that emphasizes an awareness of one's body through a series of rigorous mental and physical exercises) and then also to have some sort of community where we could get together and work through new drafts of plays we are writing or to workshop things," she says. "It was important for Roshni and I to get other people we trusted and admired as artists, like Lea and Darcie, who have different perspectives and different aesthetics," López Reyes says, "so that we would have a system of checks and balances and people involved who would challenge us as artists, too." Indeed, each company member brings something unique to the southland company table. Crager, who is from Michigan, is a puppeteer and a director who also created her own theater company, the fledgling Theatre Raw, which is "devoted to creating contemporary performance that experiments with a myriad of styles and is inspired by a multitude of cultures." "It's exciting that I'm able to work with two different companies with different missions, and they still fit who I am as an artist," she says; Shukla, an actress, says receiving her undergraduate degree in business administration is proving useful with their new venture. "Sometimes we get so caught up in the art that we forget there's a business component that we need to balance," she notes. Madda, who is from Los Angeles' San Fernando Valley, is an actor who received her bachelor of music in performance degree from Boston University with an emphasis in classical voice. The quartet envisioned their new company to be a reflection of all they learned as students — and being proactive about their careers after graduation, even while waiting for their "big break," was something that was routinely stressed by UCLA TFT Department of Theater Professor J.Ed Araiza, who along with Professor Jose Luis Valenzuela offered them valuable advice when they were setting up shop. "The most important thing I told them was to go out and create some work as soon as possible and to not worry about it being the perfect production; it could be a small project, a reading or a workshop production," Araiza says. "It's very easy to let the original excitement and energy of forming a company dissipate in the weeks and months that follow. Working with other like-minded artists will keep them going longer, but they have to have a reason for consistently getting together and working." Both Araiza and Valenzuela are founding members of their own well-established and respected troupes, SITI Company in New York and The Latino Theater Company (LTC) in Los Angeles, respectively. 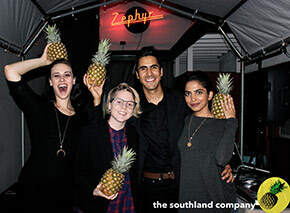 The southland company officially launched in June with a theatrical presentation at the Zephyr Theatre in Los Angeles that coincided with the last day of a successful Kickstarter campaign. Since then, the southland team has been hard at work, securing 501c3 status and preparing for their first season. They intend to deliver two productions a year, one in the spring and one in the late fall. In Spring 2017, they will workshop The Gita and the Gun, written by Shukla, about a girl who is the target of bullies. Crager will direct. "The reason the model is the way it is (the showcasing of one contemporary and one classical production each year) is because we were taught that our training is classical for a contemporary world," Shukla says. "That is exactly how we see our work." Looking to other established theater companies such as The Actor's Gang and A Noise Within, they envision southland developing into a world-renowned venture open to actors and playwrights from all over. They also see collaboration as a hallmark of their efforts — even with different forms of entertainment. To that end, they intend to have the involvement of filmmakers and musicians in their theatrical productions. "We want to integrate different mediums and have a kind of cinematic quality in a stage production," López Reyes says. For now, however, "our commitment is to UCLA, our own cohorts," he adds. "We have a shared vocabulary and skill set that we've developed over the years. We're going to continue with that." They have another commitment as well: To give back to the community by providing free arts education to disadvantaged youth. The first event in their Literacy through Theater program, which will be an ongoing initiative for the southland company, is a collaboration with the educational non-profit Heart of Los Angeles (HOLA). On Thursday, Dec. 8, they will host a Shakespeare workshop for middle school and high school students, working with text from As You Like It, which they plan to stage in Fall 2017, directed by López Reyes. "Through this workshop we hope to engage students both physically and intellectually through the use of theater games and with Shakespearean text," Shukla says. "The hope is to promote an appreciation for theater arts and literacy through classical theater. If we can even inspire people to go to the theater by presenting it to them, then we've done our job." Interested in supporting the southland company? Visit the "Give" section of the southland company website or simply click here.